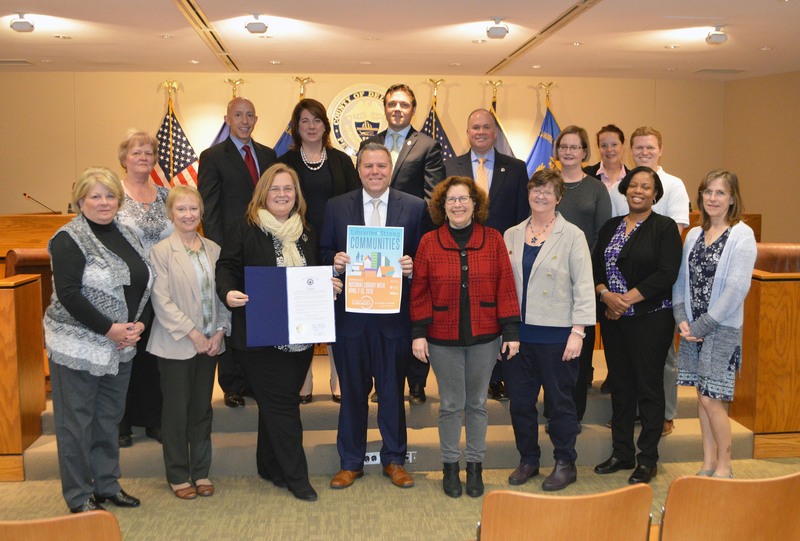 Delaware County Council joined Delaware County Libraries Director, Cathy Bittle and librarians from across the County to recognize National Library Week during the April 3 public council meeting. Each year Delaware County libraries participate in National Library Week, an annual celebration held in April, highlighting the valuable role libraries, librarians and library workers play in enhancing our communities. This year’s theme for National Library Week is “Libraries = Strong Communities.” First sponsored in 1958, National Library Week is a national observance sponsored by the American Library Association and celebrated by libraries across the country. This year’s celebration will be held April 7-13. The Delaware County Library System was formed in 1981 by County Council to coordinate the activities among our 26 member libraries. The mission is to support and enhance the programs and services at the independent libraries. Jointly, those libraries circulate 2.5 million books each year. Today, there are more than 270,000 library-card-carrying members of the Library System. Libraries in Delaware County are the heart of our communities, offering a wide variety of programs such as storytimes, career workshops, technology classes, STEM activities, and much more.